Release Date is January 31. Old Toy Soldier is a "perfect binding" Quarterly magazine. 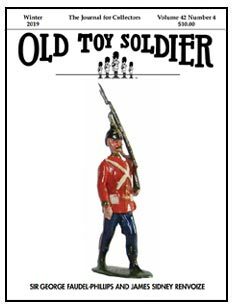 In continuous publication since 1976 this fully indexed journal has logged over 750 articles on the full range of toy soldier topics and makers. Ray Haradin acquired Old Toy Soldier and recruited the renowned author and auction house expert Norman Joplin to be editor. Since then they have expanded coverage through well researched and written articles, moved to a color format and increased subscriptions. For the past 32 years, the words "Old Toy Soldier" have become synonymous with Toy Soldier collecting, formerly Old Toy Soldier Newsletter, as some of our long time contributors still refer to it, the magazine has been an integral part of the Toy Soldier Hobby with its informative articles and regular features on all aspects of collecting Toy Soldiers and Figures. Since the publication changed ownership in 2001, I have been proud to have assumed the mantle of editor, thus carrying on the tradition started by Steve and Josie Sommers.